CoLab Radio » Blog Archive » What makes a good civic space? What makes a good civic space? 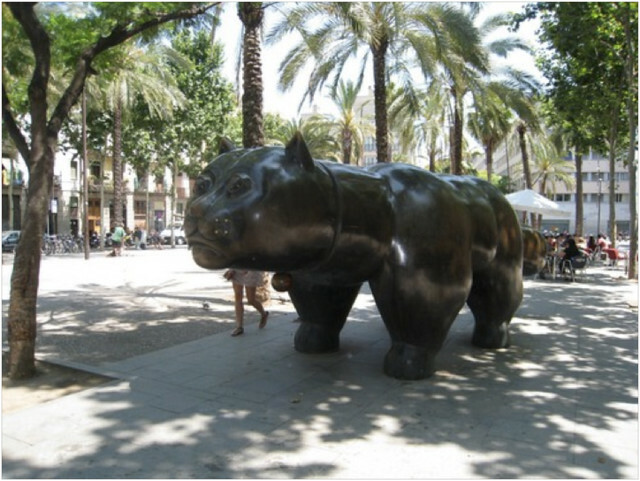 Feranando Botero’s Gato sculpture in the Rambla del Raval, Barcelona. What makes a good civic space? That is a question I often pondered during my graduate studies at MIT´s Department of Urban Studies and Planning. In fact, the topic of civic space interested me so much that it propelled my exploration of art, culture, and urban design along the Los Angeles River for my MIT masters thesis. As a part of my thesis research, I collected hand-drawn maps of civic space visions for the L.A. River from various stakeholders and community activists along the River. These maps and my thesis research reflections are featured in my previous MIT CoLab Radio series: Thesis Chronicles. The concept of civic space is certainly not a new one. Broadly defined, civic space includes plazas in Latin America to squares in Europe; from public markets in Asia to revitalized waterfronts in the United States, and many spaces in between. Well some are world renown like New York´s Central Park, others are less familiar, but remain just as vital as their popular counterparts. Civic spaces are the foundations for great cities. Apart from distributing a level of stewardship among diverse groups, civic spaces provide neighborhood identity, support local economies, help the environment, provide settings for cultural and social activities, and connect communities. According to Projects for Public Spaces, “Civic spaces are an extension of the community. When they work well, they serve as a stage for our public lives. If they function in their true civic role, they can be the settings where celebrations are held, where social and economic exchanges take place, where friends run into each other, and where cultures mix.” Yet, because civic spaces are spaces for socialization, cultural contact, and collective action, they can also serve as spaces of conflict. As a result, the social and cultural value of spaces are just as important as the space’s physical design. My first visit to Barcelona was in 2001, after completing an undergraduate internship in public history/historic preservation advocacy with the Los Angeles Conservancy through the Getty Foundation´s Multicultural Undergraduate Internship Program. I was full of new ideas on how to see–and interpret–cultural history and urban spaces. It was almost 10 years after the 1992 Summer Olympic Games and Barcelona was in still in the midst of its complete transformation into an international example of civic space design and urban planning. I was so taken by what was occurring in Barcelona that I knew that one day I would have to live here to fully understand its transformation. In regards to Los Angeles, it was not until I was in the process of writing my thesis that I finally understood what happened (or did not happen) to civic space in the city. Los Angeles developed at a rapid pace in the 1950s, after the post-World War II housing boom. The construction of new homes on large suburban tracts of land, as well as the expansion of the Los Angeles Freeway network and the rapid increase in car-ownership, enticed people to live away the civic core. At the time, Los Angeles was large enough to offer people their own yards and pools. The city soon forgot about collective civic space. Furthermore, the 1960s would lead to an entirely new era for Los Angeles: urban renewal efforts which made living in Los Angeles´ core uninviting and the city’s orientation towards the beach made it inaccessible to all. These reflections were echoed during a recent conversation with a fellow urban planner and new friend in Barcelona. “The reason civic space is successful in a place like Barcelona is because interacting with others in public is a social ideal most Europeans could not live without.” If this was the case, what did this say about social ideals in Los Angeles and other cities lacking civic spaces? This is the second post in John’s series, Transforming Civic Space: Learning from Barcelona. This series is part of the Portraits of Place project. John, this is really interesting. It does make me wonder what our values are regarding civic space in Los Angeles. The idea of density seems to scare typical Angelenos (from all parts of LA), who tend to hold up a fantasy of the (all residential) neighborhood and the single-family home as an ideal. At the same time, the places that many Angelenos describe as their favorites– from Venice Beach or the Promenade, to Silverlake, Plazita Olvera or Macarthur Park, are places with higher density, walkable streets and vibrant civic space. For some reason the idea of this interaction is scary in principle, but favored in practice. Thanks for your comment Stephanie! I love how well you understand LA. It’s true. I feel that having so much space (at one point in LA’s development history) made it easy for us to “forget” about civic space. Now as more and more people move to LA – especially immigrant populations – it’s important to re-think the social values and importance of places for recreation, cultural expression, and general social interaction. And given the range of cultural diversity in LA, this could be such a great thing. Let’s cross our fingers! 🙂 We can both be back in LA soon and help facilitate the process through design, civic engagement, civic media, and other relevant tools.